The research & development project jointly proposed by Shinshu University and Nagano Prefecture "A Shinshu-Method for Regional Innovation Ecosystem by Industrial Implementation of Innovative Inorganic Crystal Material Technology" was adopted in the "Regional Innovation and Ecosystem Formation Program" offered by Ministry of Education, Culture, Sports, Science and Technology (MEXT) on July 31st. 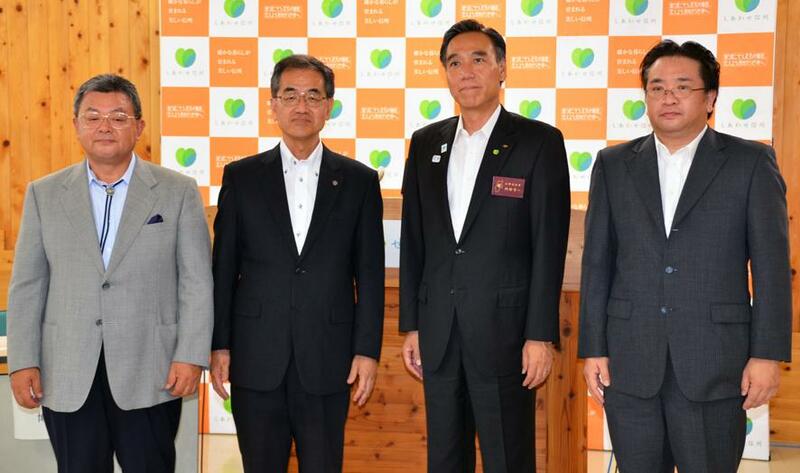 On August 4th, President of Shinshu University Dr. Kunihiro Hamada, Nagano Prefectural Governor Mr. Shuichi Abe et al. held a press conference at Nagano prefectural government's office. The core technology of this project is “the Flux Method” that is a crystal growth technology using molten-salt process and providing high-function inorganic crystals. The Flux Method is a world-leading research in Shinshu University. Shinshu University and Nagano Prefecture collaboratively work on 3 commercialization projects, including "Water Treatment" (commercialization of water purifiers with heavy metal adsorbents) "Bio-composite Materials" (development of highly functional, highly durable artificial joint and spinal vertebral body spacer) and "Electronic Materials" (development and commercialization of materials that make lithium ion secondary batteries more advanced). Shinshu University and Nagano Prefecture will also establish an eco-systems to create further commercialization project.